In March 2011, a flash flood, or Warrambany (‘angry water’) , swept along Turkey Creek, which runs through the middle of the community, broke its banks, and destroyed Warmun. People were evacuated and the handful who stayed watched as hundreds of contemporary art works were washed out of the Warmun Art Centre into the swirling floodwaters and out of sight. Working with Art Centre staff, including Roseleen Park and her husband Wayne Hughes, who had remained in Warmun, the local mining company, Argyle Diamonds, airlifted the artworks 200 kilometres to the safety of its offices in the closest town, Kununurra. Two staff from University of Melbourne’s Centre for Cultural Materials Conservation (CCMC) arrived to work with additional staff from Warmun Art Centre and Waringarri Arts in Kununurra, the Argyle Diamond Mine, and ANKAAA and with the Warmun community to assess, document and stabilize the 400 works in the Warmun Community Collection. Several hundred works requiring laboratory based conservation treatment were loaded into a refrigerated truck provided by transport company Toll Holdings and driven 4,500 kilometres to CCMC. As the project required extensive funding in addition to that provided by the University, a call went out for assistance. The response was immediate and has resulted in the formation of the support group, Melbourne Friends of Warmun. For the next two years this disaster brought Gija artists and senior knowledge holders, Warmun Art Centre staff, CCMC staff and students and supporters together to grapple with the task of conserving the collection. 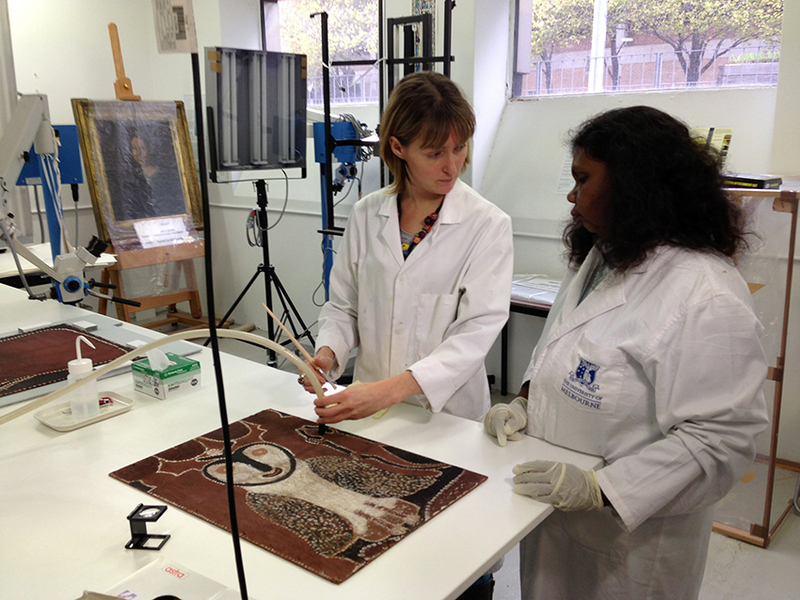 In 2013, Warmun Art Centre and the University of Melbourne embarked on a new two-way learning program with conservation as the core university discipline, and Gija knowledge as the informing cultural foundation. Image: Sophie Lewincamp from CCMC and artist Roseleen Park examine the works. The conservation program developed as a rich and rewarding opportunity to engage in practical, theoretical, philosophical, analytical, and cross-cultural learning for Gija artists and art centre staff, and University of Melbourne staff and students. 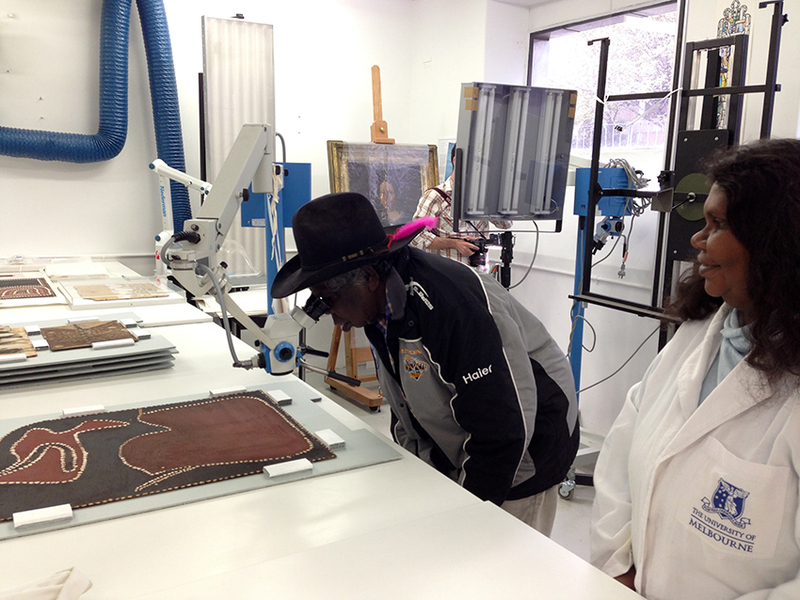 In line with the two-way learning framework established by the Gija elders in the 1970s, Gija elders and senior artists visited Melbourne to discuss treatment options and guide decision-making, and staff from CCMC visited Warmun to build an understanding of the role of the collection in Gija culture. Conservation students were able to work on the collection under appropriate Gija and CCMC staff guidance. Critical to the success of the conservation treatment was the advice received from Gija elders regarding the source, location, material characteristics and production methods of the ochres and natural binders used in the works. This information was delivered via onsite interviews in Warmun and Melbourne, lectures to students via Skype and on-country learning. It was also incorporated into the documentation associated with the collection, resulting in a database with painting records and condition reports. The works were returned to Warmun in June 2013. This return was celebrated with the performance of the significant Goorirr Goorirr. Concurrently in 2013, Warmun Art Centre and CCMC at the University of Melbourne began working towards a revolutionary new two way learning partnership, which would elevate the original Gija two way learning program to University level. The groundwork for this partnership in 2013 was characterized as the ‘getting to know you year’. In November 2013 a partnering agreement was developed to formalize the partnership. The principles enshrined in this document support the development of programs that demonstrate and facilitate best practice approaches to two-way learning programs that share Gija knowledge and University knowledge. This partnership enables CCMC to understand Gija knowledge as a demonstration of Australian Aboriginal knowledge in order to improve its teaching, research and engagement programs. For Warmun Art Centre it validates and acknowledges the value of Gija knowledge in a tertiary institution, as well as the more pragmatic outcomes of providing enhanced opportunities for Gija employment, education and shared learning which are not available at the moment. The program is developed through teaching, research and engagement programs, focused on curriculum content that is developed by Gija people with support of the University of Melbourne. 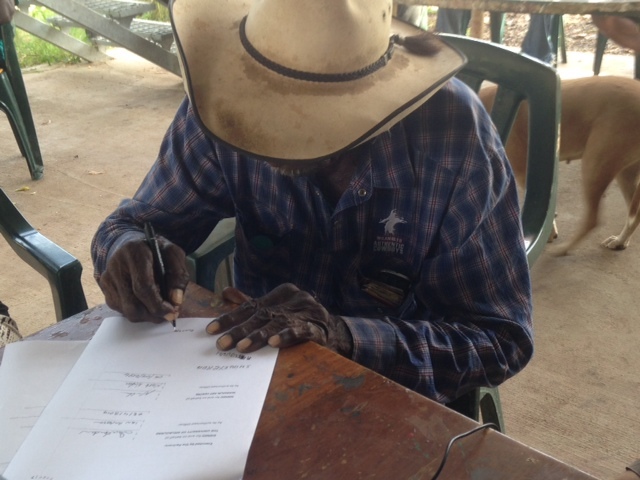 Image: Rusty Peters signs the partnering document, ‘Bangariny-warriny jarrag booroonboo-yoo – Two good ideas talking together’.